This summer, Executive Director Kemi Ilesanmi interviewed Bridget Bartolini (CC Fellow ‘13, Commissioned Artist ‘14) and Cynthia Tobar (CC Fellow ‘16) about their respective ventures into the field of oral history. During their engaging conversation, Bridget and Cynthia discussed the power of oral history in community work and Bridget discussed the inception of her community engagement project, Five Boro Story Project, and its recent program “Bushwick Love Letter”, a collaboration with Cynthia’s “Cities for People, Not for Profit” oral history project. Kemi: What brought each of you to oral history and storytelling? Cynthia: I fell in love with oral history because I wanted to seek out a documentation process that was not so top-down but more egalitarian in approach, more accessible to people. Oral history provides a gathering space for folks to learn from one another, to thrive, to gather, to listen. And you need to learn how to listen in order to be an effective agent for social change. Oral history prompts you to do that, and I instantly fell in love with it. I got into oral history around 2010, and it’s such a supportive community because people share knowledge. I was working at the Graduate Center at the time so I knew a lot of public history folks, and I was going to Columbia University Oral History public seminars, and folks were sharing their information with me. And when people come to me and ask me for resources, I’m always sharing with them. It’s very communal. K: And what about you, Bridget? Bridget: I got into oral history maybe in the past two years. I got my Masters in Community Education in 2012. I first thought of the Five Boro Story Project as a community education project, and started producing community events that bring New Yorkers together through sharing personal stories about our neighborhoods. And then when I got the Create Change Fellowship with The Laundromat Project, it was there where I learned about socially engaged art, and I was like, “oh my god, there is a term for what I’m doing!” It felt really great to know that there is this framework, and what I’d already been doing kind of intuitively fits into it. And similarly to how I discovered I was doing socially engaged art, I then discovered I’m doing oral history. Some of our grants that we got, like from Citizens Committee for New York City, put us in the oral history category. And I realized I should learn more about this field. So now I’ve joined the Oral History Masters Program at Columbia. K: You’re both native New Yorkers, and stories are captured in place––like the places we live. 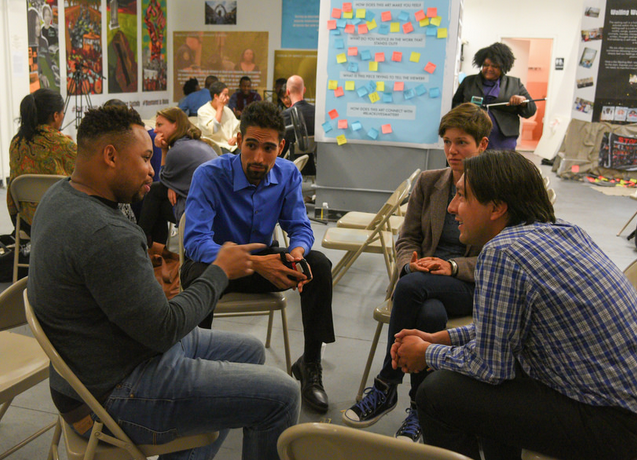 How do you think about storytelling, oral history, public history, and community education, in relationship to the way the city has shifted? C: I think for me with oral history and entering communities, it was always much less about telling people “this is how it ought to be.” Even with oral history sometimes I feel uncomfortable with it because it seems so academic and formal, when it should be more about giving others a sense of agency. I talk with everybody, and I love getting to know my neighbors, and I love my street. And I began telling more people about what I’m doing, and they get excited, and they want to take part in it; it helps build this level of empathy. B: I think a really wonderful thing about storytelling and oral history is that everyone has a story to tell, and you are the expert of your own life. It can be a really affirming experience––being listened to, and being heard. 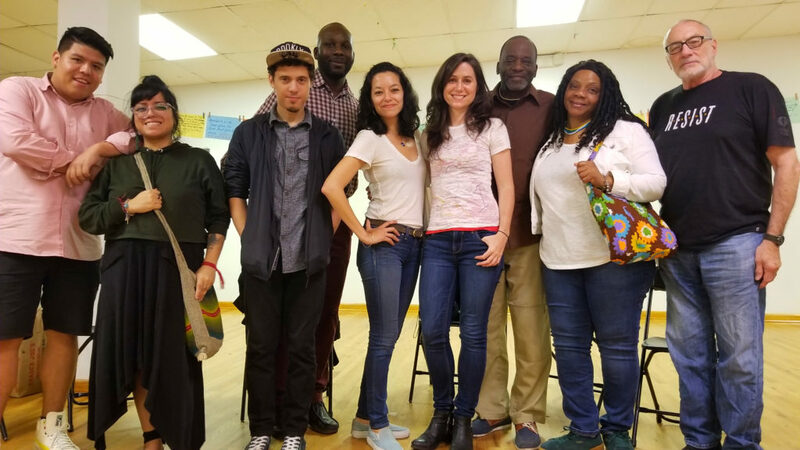 With the Five Boro Story Project, most of the featured artists are not professional storytellers, but community members where this is their first time on stage talking in front of a bunch of people. I think for a lot of storytellers, it is a really empowering experience getting to do that. K: I’ve gotten to attend a couple of them and loved the experience of listening. What do people say to you afterwards about their experience of telling their stories? What’s their journey in telling that story? B: You know, everyone’s different. We definitely get a lot of good feedback. 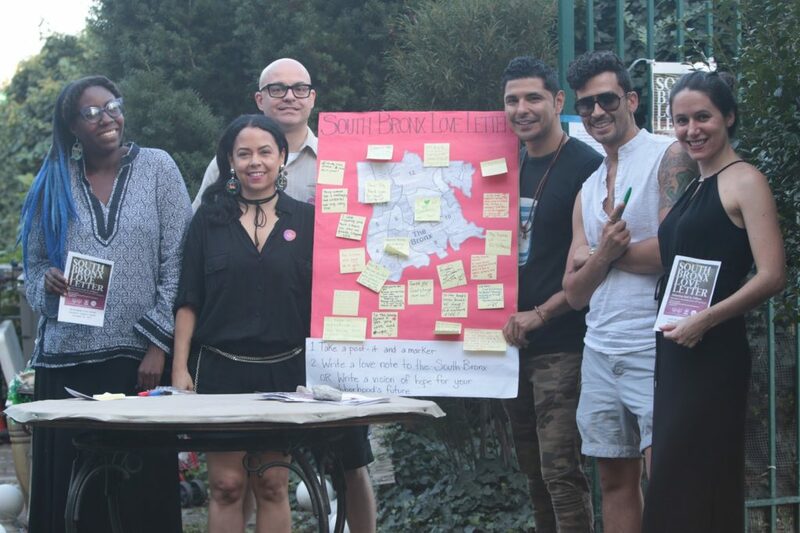 Each event is focused on a specific neighborhood, and the people who I invite to be storytellers are people who are really connected and really love their neighborhoods. I feel like a lot of people make friends through participating in the events. A LP person who [has been] a featured storyteller is Yvette Ramirez (former Program Coordinator). She told a story last summer about growing up in Astoria, and she said it was a powerful experience. I don’t remember her exact words, but she felt nervous about telling her story publicly, and during the event she felt genuinely surrounded by neighbors, and then felt proud of herself that she had done it. K: In academia, oral histories might be kept behind a locked door. One of the things I love about Five Boro Story Project is that the whole idea of “public-ness” is built into it. How you think about issues of access and permanence. B: When I started the Five Boro Story Project, I was not thinking about documentation or archiving and I quickly realized how important that was. Not coming from an oral history background, but rather, community education, I wanted to produce public programs that bring people together. It was like, you have to be there, physically, to experience it. So we do a lot of story circles and smaller workshops where we don’t record anything, but for every event that has performances by featured artists, we record it, and we have a YouTube channel! K: Can you share a little bit about the process and values that you bring to curating who is on stage? B: That has changed too as the Five Boro Story Project has evolved over these five years since I’ve been doing it. In the beginning, I had more people who were semi-professional storytellers, poets, musicians who have pieces inspired by their neighborhoods. 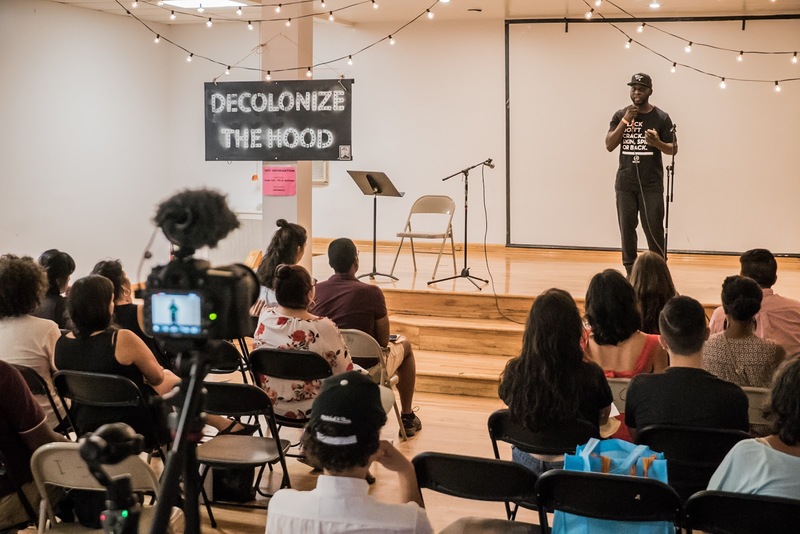 I guess as I kept producing events, I realized the value that these storytelling programs have in potentially assisting community organizing by amplifying work that activists and organizers are doing in their neighborhoods. So, I’ve been having more people who are doing really important work in their neighborhoods who I want to help get the word out and help them connect to more people. But definitely, always from the beginning, I was really conscious of having diversity in people’s backgrounds and ages, and I really like having grandmas who are just great storytellers but not normally in these kind of settings. We’ve had 19-year-olds and 91-year-olds telling stories at the events. And definitely, whatever neighborhood it’s in, [I try] to get people who, I think, agree on some political level, but who also have different perspectives on the neighborhoods. B: Oh, all different kinds of people. Partnerships are such a big part of the Five Boro Story Project, because obviously, I’m going into a bunch of different neighborhoods that are not my own, so having partners who are deeply rooted in the neighborhood is really important. Partners help involve more local people in the events. K: To continue with this idea around partnerships, Cynthia,you have partnered with Make the Road New York and Welfare Rights Initiative (WRI). Also, your website describes you as an activist scholar. How do you relate to this word “activism” and how does that inform who you partner with and to what end? C: It’s sort of like trying to be involved with documenting what activists actually do, so people feel inherently less scared about being involved, or understand what it actually is. We’re addressing a need, a need for you to be civically involved, which everyone is being sort of discouraged to do. We don’t even receive a civics education in public schools anymore. It’s not even a mandated subject. And so when you talk about what activism really is, it’s sort of this proactive way of being informed, and being an agent of change in your neighborhood. And when you talk about it that way, activism seems a lot less scary and divisive, and much more inclusive. I come from a long line of family members who are very opinionated and very involved in our communities, because we have to. But that’s sort of like a value that’s nurtured, right? That’s something that you grow up with, but if that’s not nurtured in you, if that’s sort of knocked out of you, then you don’t question it; you just take it as is. Which is why I’m so fascinated with documenting activism, because these folks, they manifest courage. Because it takes a lot of courage for you to step out there and say this isn’t OK. Because from a very young age, you’re taught to shut up and listen, be respectful, be respectful to agents of authority. But what if that agent of authority is not acting on behalf of your own interest? They’re policing your community; they’re making assumptions. You know, you feel that it’s just not right. It’s OK to speak up, and that ability, needs to be encouraged. K: Bridget, you’ve worked with a number of LP artists, including Cynthia, Priscilla [Stadler], Ro [Gorrido], and Betty [Yu]. I would love to hear more about your LP collaborations in particular? B: I love collaborating with LP folks because I feel like we have this shared understanding and shared values. That’s one of the things that I like about The Laundromat Project too, is that it does tend to attract a higher-than-normal concentration of native New Yorkers, which I think is probably because it’s so much about love and neighborliness, and people who really care about and love their neighborhoods. I’ve met so many great, wonderful, creative, inspirational, and brilliant people through The [LP]. When I meet them, I’m adding them to my mental list of [storytellers]. K: How did the Bushwick Love Letter happen? 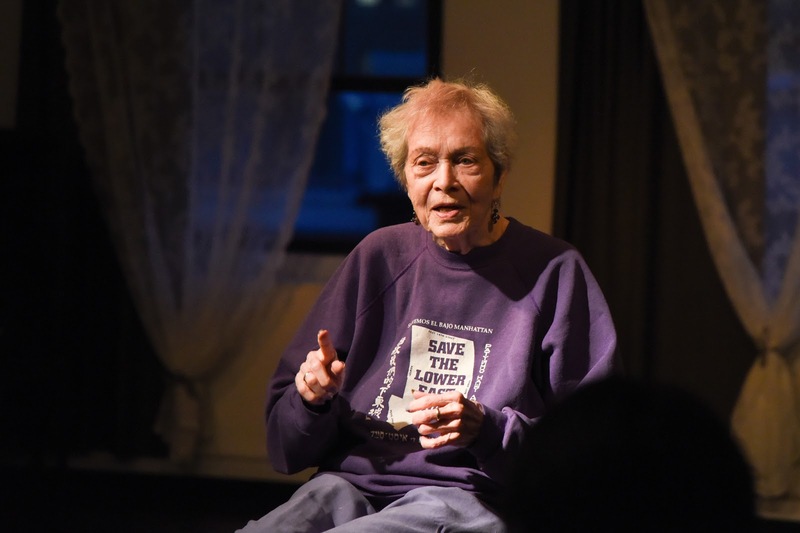 B: Well, I was talking to Josh Carrera, who is also a mutual friend of Cynthia’s, who she interviewed for Cities for People Not for Profit, her oral history project about gentrification and housing activism in Bushwick. Josh works with Mayday Space, a wonderful movement space that Cynthia and I have both volunteered with. We wanted to do something to support the struggle around gentrification and displacement happening in Bushwick. I was like, yes, Bushwick Love Letter. And then, I contacted Cynthia. C: So that’s how that happened, and that has been super fun. It’s just great, and it happened in a really auspicious time because of everything that’s going on with the re-zoning at the moment, and so it’s a really–– I mean, when is it ever not a topic of conversation––but particularly now is a pivotal year, and it’s so important for people to be informed about these decisions. Whether or not it will be something that will move along the lines of what would satisfy the community has yet to be seen. But the fact that it’s provided a platform so people can actually get activated and know about it is important. It’s also introducing the community to many people who are passionate and love Bushwick, but have different perspectives of how to deal with this problem. You deal with problems by coming together and listening to one another, and the storytelling aspect has been so super helpful for that. B: Yeah, storytelling is really great for that. 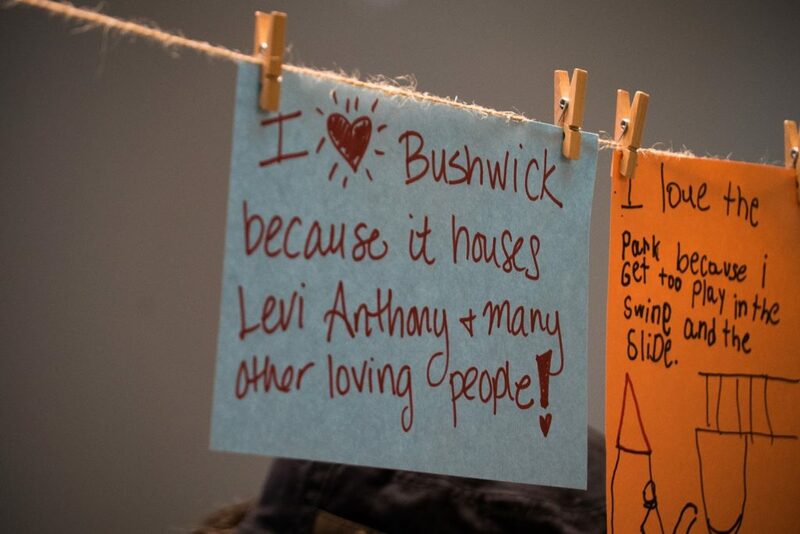 Like, with Bushwick Love Letter, we are working with people from different groups where there’s some tensions between these groups, and it was important to us to bring them in the same space despite those, or especially because of those differences and tensions. K: I love that. What are you guys excited about that you’re working on besides the Bushwick Love Letter? C: Well, I’m trying to reel Bridget in for this event that I’m planning for next year at Bronx Community College talking about community and storytelling, along the lines of the Hall of Fame for Great Americans. We’re planning “Reclaiming the Hall: Empowering Community Voices at the Hall of Fame” where we’re going to bring in various players and community organizations, and I would love to have Five Boro Story Project also involved. It’s going to be a community art event centered around the Hall of Fame, and what makes a great American. It’s the first Hall of Fame in the country which no one knows about. I would love people to learn more about it, and not just from the controversial context that we had, like, these troublesome monuments, but then, again, it’s sort of like embracing the troublesome past but then thinking about it as a springboard to create something different. B: For me, this fall, I’m going to be taking a little break, because I’m starting the Oral History masters. I’m super excited about that. In Summer 2019 the Five Boro Story Project will do a “Jamaica Love Letter” series in Queens. K: A very quick question – how did you meet? C: We met through More Art, and then that relationship was bolstered by The LP, because [Bridget] had been in The LP, and I was at The LP the same year. K: Oh wow. Thank you. This has been incredible for me. I’m so inspired by you both.